Blood monocytes are young cells that already possess migratory, chemotactic, pinocytic and phagocytic activities, as well as receptors for IgG Fc-domains (FcR) and iC3b complement. Under migration into tissues, monocytes undergo further differentiation to become multifunctional tissue macrophages. For many research projects it is important to differentiate cells of the monocyte/macrophage lineage. 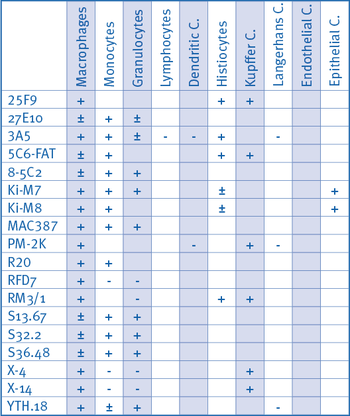 Some macrophage specific proteins and specific clones useful for such an application are presented in the table below. 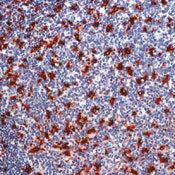 Allograft Inflammatory Factor-1 is a Ca2+-binding peptide produced by activated macrophages and microglial cells. AIF-1, like the peptides MRP8 and MRP14, is expressed by activated macrophages and might participate in a variety of pathogenic processes in the mammalian brain and in chronic transplant rejection. Clone RM3/1 (BM4021) recognises the late stage inﬂammatory macro- phages scavenger receptor (CD163), a membrane glycoprotein on human monocytes and macrophages which is expressed in the intermediate and late phase of inﬂammation. The antigen is a member of the scavenger re- ceptor family. CD163 is signiﬁcantly up-regulated by glucocorticoids while it is down-regulated by cyclosporin A and by phorbol esters. An important function of CD163 seems to be in the adhesion of monocytes to activated endothelial cells. RM3/1-positive cells include skin histiocytes, Kupﬀer cells, spleen macrophages of the red pulp, and some thymus macro- phages. The antigen is found abundantly in human term placenta, and regularly in acute and chronic inﬂammatory lesions. A diﬀerent epitope of the same antigen is recognised by antibody Ki-M8 (BM4112). RM3/1 is useful for macrophage phenotyping, for the classiﬁcation of intermedi- ate inﬂammatory stages in tissue sections and cell smears (together with clones 27E10 (BM4025) and 25F9 (BM4022)), for the characterization of tumorous tissues, and monitoring of macrophage cell cultures. CD68 could play a role in phagocytic activities of tissue macrophages, both in intracellular lysosomal metabolism and extracellular cell-cell and cell-pathogen interactions. Binds to tissue- and organ-speciﬁc lectins or selectins, allowing homing of macrophage subsets to particular sites. Rapid recirculation of CD68 from endosomes and lysosomes to the plasma membrane may allow macrophages to crawl over selectin-bearing sub- strates or other cells. Highly expressed by blood monocytes and tissue macrophages CD68 is also expressed in lymphocytes, ﬁbroblasts, endo- thelial cells and in many tumor cell lines which could allow them to attach to selectins on vascular endothelium, facilitating their dissemination to secondary sites. There are several antibodies available now to detect MIF Related Proteins [MRP; Clones 27E10 (BM4025), MAC387 (SM2011P), 8-5C2 (BM4028), S13.67 (BM4029), S36.48 (BM4026) and S32.2 (BM4027)], which are ex- tremely useful in the analysis of several disease conditions, particularly in the inﬂammatory diseases and certain microbial infections, as well as neoplastic conditions. Clinically relevant is especially the detection of MRP8/14 in certain autoimmune conditions and transplant rejection. MRP8 (Calgranulin A, 10.8 kDa) and MRP14 (Calgranulin B, 13.2 kDa) belong to the S-100 protein family (S100A8 and S100A9) and can form Ca2+ dependent homo- or hetero-complexes of various composition. The MRP8/14 heterocomplex is also known as Calprotectin, L1 Protein (not related to the neural adhesion molecule L1) and cystic ﬁbrosis antigen. MRP8/14 is found in cells, tissues, and ﬂuids in all parts of the human body. 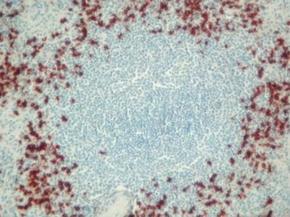 It is mainly a myelomonocyte and keratinocyte protein. In neu- trophils MRP8/14 is located in the extralysosomal cytosol in concentra- tions estimated at 5-15 mg/ml, which corresponds to about 5% of total proteins in neutrophils. Numerous biological functions can be attributed to MRP8 and 14. The S-100 like structure and the calcium dependent as- sociation to cytoskeleton structures suggest intracellular signal trans- duction functions. The antimicrobial function of MRP8/14 has been well documented. While MRP8 is chemotactic for neutrophils, MRP14 seems to have just the opposite eﬀect. Most important however, the presence of MRP8/14 in acute, and its absence in chronic inﬂammation is an excellent tool in assessing a vast number of pathological conditions. 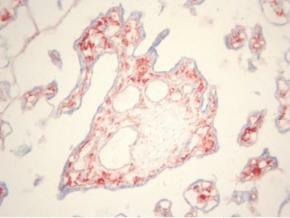 is reactive with all tissue macrophages, binding to a cytoplasmic epitope. In peripheral blood the antibody stains all granulocytes and around 50% of monocytes. 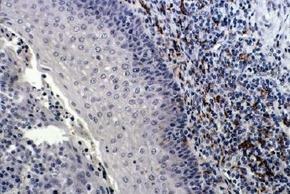 No staining of osteoclasts or Langerhans’ cells is seen. 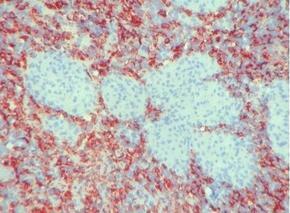 recognises an antigen which is predominantly expressed cytoplasmically in mature tissue phagocytes. 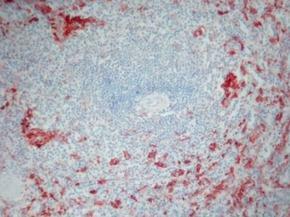 RFD7 is co-expressed with RFD1 on suppres- sive macrophages. RFD7 does not react with circulating monocytes or any cells within the granulocyte series. recognises tissue macrophages and macrophages in prolifera- tive disorders of macrophages. PM-2K is one of the markers that, being negative on dendritic cells, can diﬀerentiate between macrophages and dendritic cells. 41 products - FILTER YOUR RESULTS!